Hurricane Chris is continuing to accelerate away from the United States, according to the U.S. National Hurricane Center in an update on Wednesday. The agency said that Chris, a Category 2 storm with 100 mph winds, is 440 miles east-northeast of North Carolina and just over 1,000 miles southwest from Cape Race, Newfoundland, Canada. It’s moving quickly to the northeast at 22 mph. Chris is forecast to pass near southeastern Newfoundland on Thursday, the agency said. The storm will weaken and become a strong post-tropical cyclone on Thursday. In Newfoundland, the storm could produce 1 to 3 inches of rain and isolated amounts of 6 inches, possibly causing flash flooding. The hurricane is expected to generate rough surf along the East Coast. “Swells generated by Hurricane Chris are expected to affect portions of the coasts of North Carolina and the mid-Atlantic states during the next few days. These swells could cause life-threatening surf and rip current conditions,” the NHC said. On Tuesday, there were 141 rescues performed in Ocean City, Maryland, due to rough surf and rip currents, ABC News reported, which added that the storm could get close to Category 3 strength before it weakens. 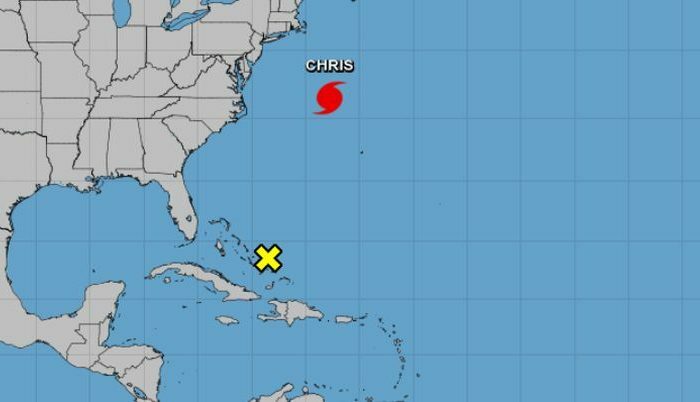 Chris is the second hurricane of the 2018 Atlantic season. Hurricane Beryl formed last week and then weakened.